A sizable gain in e-commerce sales last month further illustrates the emergence of Internet-based commerce as a substantial force that is prompting a response from shopping center owners and developers. The continuing migration of sales online and shrinking footprints of many retailers are encouraging efforts to not only backfill vacant spaces but also to identify new traffic drivers and reimagine tenant mixes. Retail property developers also continue to respond, eschewing the large multi-tenant formats of the past in favor of single-tenant and mixed-use concepts. The changes underway in the retail sector will provide opportunities for shopping center owners to redefine their properties by offering a combination of goods, experiences, and services in a convenient format for consumers. Over the last year, through July, retail sales excluding gasoline and automobiles advanced 3.8 percent, a level in line with the long-term average. Key categories of discretionary consumer spending tied to household formation and homeownership outperformed, with receipts at furniture and home furnishings outlets rising 4.3 percent during the last four quarters. Building material and garden supply sales are showing similar strength, posting a 3.5 percent gain as higher housing prices motivate homeowners to renovate. E-commerce outlays surged as well, with non-store sales vaulting 14.1 percent from one year ago. Macy’s announcement that they will close 100 additional stores marks the latest instance of a high-profile full-line retailer trimming its store count. 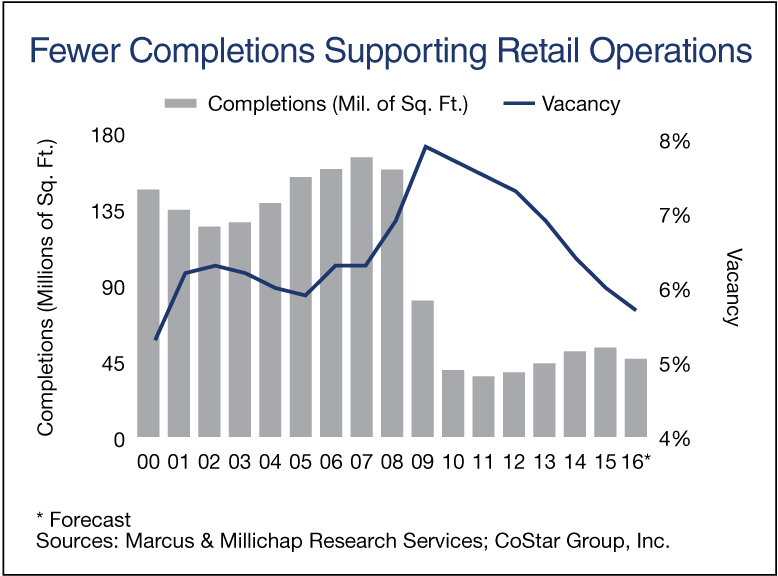 Store closures create near-term vacancies but can also provide opportunities for shopping center owners to refresh a property. The departure of large tenants has enabled some shopping center owners to divide the vacated spaces into smaller floorplates and re-tenant with restaurants, service providers and specialty merchants that draw shoppers. Service providers have emerged as especially significant new occupants of multi-tenant space, with non-traditional users including medical practices and financial planners making up a bigger portion of shopping center tenancies. The shift of more consumer dollars online is encouraging a decline in retail property construction that continues to benefit retail property performance. After exceeding an average 120 million square feet annually from 2000 to 2008, yearly completions have since averaged about 49 million square feet. The completion of predominantly single-tenant formats this year will minimize pressure on the vacancy rate and contribute to a decline in nationwide vacancy to 5.7 percent. Construction of mixed-use developments with apartments over ground-floor retail has been extremely popular in urban areas. A significant portion of the 285,000 new units coming online this year will be in the urban core, although the effects on national apartment vacancy will remain minimal due to robust demand. This year, the national multifamily vacancy rate is on course to end the year at 4.2 percent and support rent growth of more than 4 percent. This entry was written by marcusmillichap, posted on August 18, 2016 at 9:48 pm, filed under Commercial Real Estate, Research, Uncategorized and tagged Retail Sales. Bookmark the permalink. Follow any comments here with the RSS feed for this post. Post a comment or leave a trackback: Trackback URL.